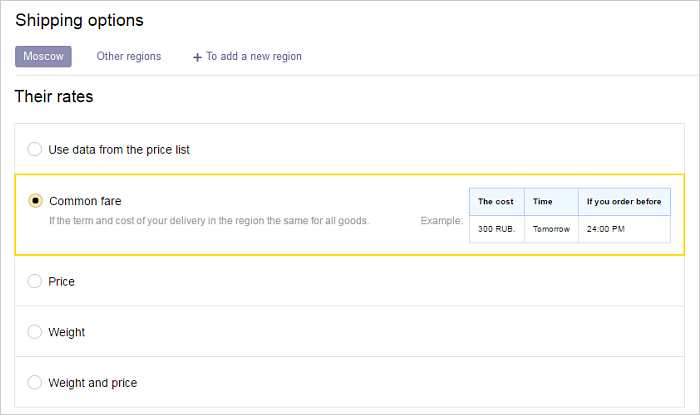 You can specify delivery periods and rates for your region as you see fit in the price list or in your personal account. The delivery terms are specified separately for each individual offer. Delivery terms are specified for groups of products. You cannot specify separate terms for individual products. Delivery rates and terms for other regions can only be configured in your personal account. Go to the Connections and setup → Shipping options page. 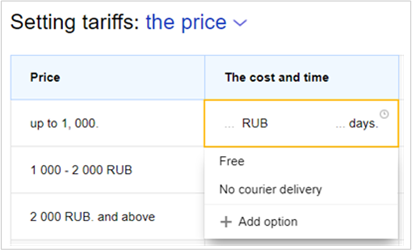 Select the Use data from the price list option and click the To fill in tariffs button. Click the To publish button. In order to transmit data in the future, use the delivery-options element in YML and the local_delivery_days and local_delivery_cost elements in the CSV and XLS formats. If you have decided to configure rates in your personal account, then simply fill out the relevant settings on the Connections and setup → Shipping options page. See the instructions below. Delivery rates to other regions. Select the desired region on the Connections and setup → Shipping Options page. 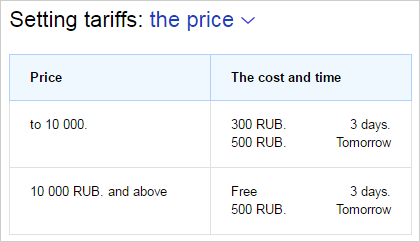 Select your rate and click the To fill in tariffs button. For detailed information about each rate, see the Types of Rates in the Personal Account section. Note. The Use data from the price list option is only displayed for your region. Specify the delivery period in business days: when it is displayed on the service, this delivery period will be converted into calendar days based on the store's business hours and the delivery service hours. For example, you can specify a range of 2–4 days, but you cannot specify a range of 2–10 days. If the delivery period is unknown, then select the “Made to Order” option. For more details, see the Configuring Delivery Terms for Typical Situations section. If you offer two types of delivery (for example, expedited and standard), use the Add option option to specify an additional delivery method. Both delivery methods must have different terms and prices. Specify a cutoff time in the field “When ordering before” (local time in the store's time zone). The specified delivery period will only be valid only when the customer orders before this time. For example, if you specify a time of 18:00 and a delivery period of two days, then at times before 18:00 users will see that the delivery period is two days, and at times after 18:00 they will see the period as three days. If you do not specify a time for “When ordering before”, then the value of 13:00 will be used by default. Attention. If the delivery period depends on the time when the order is placed (i.e., you configured the “When ordering before” setting), then you do not need to create two delivery methods with identical prices but different delivery terms. 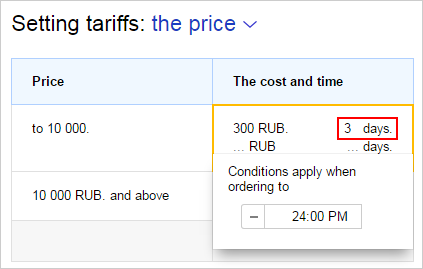 Yandex.Market will automatically update a delivery period for which a “When ordering before” time has been specified (at soon as this time occurs). The store offers two types of courier delivery: standard (within three days) and expedited (next day). Standard delivery costs RUB 300 for products under RUB 10,000. Products over RUB 10,000 have free delivery. Expedited delivery costs RUB 500 for all products. Delivery periods are valid only when ordering before 16:00. When taking all factors into account, the most appropriate rate is “Price”. You must specify RUB 10,000 in the field “less than”. The “RUB 10,000 or higher” option is added automatically. You need to specify the cost of standard delivery (RUB 300) in the The cost and time column. The system will suggest that you add another delivery option: click Add option since you also offer expedited delivery. Next, you must specify a standard delivery period of 3 days. The system will automatically suggest that you select a cut off time by which an order must be placed in order for the delivery terms to be valid (according to the terms in the example, orders must be placed by 16:00). 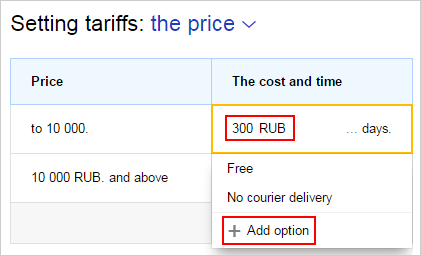 You should use the line for the second delivery option to specify the following expedited delivery settings: RUB 500 and 1 day.